As we all know, Google's content display network, as well as many other successful setups rely on delivering targeted adverts to users to increase the chances of adverts falling in front of the desired audience. I can't quote or link to any specific examples, but I've read many, many, many complaints from users online that keep seeing adverts for things they've searched for. From a user experience point of view, what is the reason for this? Common sense surely dictates that someone that searches for "buy baseball bats online" might have an interest in buying a baseball bat online - and to an extent, other products relating to baseball. Surely it's a good thing that they see adverts relevant to their interests? Why would seeing adverts for baseball goods/products not be desired over something completely random like movie rental or new dishwashers? Given that this question has become quite popular, I'd just like to point out (for the record! ), that I don't enjoy my browsing experience being disrupted by adverts either; in fact, most of the time I do not even notice them (or when I do, depending on the advert it can give me a negative impression of the brand in question). This point is out of the scope of the question, the question was specifically to do with why users seem to complain more over targeted ads, than untargeted - which I believe we have some extremely helpful and definitive answers to. Users don't spend all their time purchasing goods on the internet - often they are doing different and completely unrelated tasks, sometimes at the same time. Most people spend a very low proportion of their online time on ecommerce websites, and even then most of the time they aren't looking to buy anything. Given this principle, users often prefer to see no adverts when they are not buying - an advert in a non-commercial context is intrusive and annoying - and this is especially noticeable when the adverts are relevant to something you were searching for earlier. Targeted advertising can feel "creepy", especially if it follows you around from site to site. It's a constant reminder that your browsing and search habits are being tracked by someone, and people's mental models of the internet generally conceive of their browsing experience as being relatively private. Even if the process is completely automated, the degree of intelligence required to display ads to you makes it seem like you're being watched. Often users reject specific adverts due to poor relevance or some other factor; they then don't want to see it again. For example, if your advert is trying to sell me a catching mitt because I've searched for a baseball bat, then that advert appearing again and again is annoying because I have mentally decided that it's irrelevant. Persistence is not necessarily a virtue in this case. This has something to do with a shift in emphasis from push to pull advertising/marketing. There is loads of evidence to show that people's favourite way to learn about new things is by word of mouth - they ask their pals or read reviews from trusted sources. In fact this has turned into a whole branch of marketing (WOMMA). Permission Marketing is another form of pull marketing. Seth Godin is excellent on the whole idea of permission marketing. In other words if you ask customers if they want to hear about your new stuff they will be much more responsive to your marketing. Both of these are examples of pull advertising where the impetus comes from the user. Targeted advertising is still using the push advertising approach. I think certainly in the West we are becoming less accepting of such push approaches. For example in Spain they have now banned all billboards on the side of roads. My perception is this will be a trend. Instead we expect companies to market in more sophisticated ways by building their brands, sponsorship and pull marketing approaches. The trend in adverts becoming more "funny/quirky" rather than informational seems to speak to this. I think facebook's approach to targeted advertising is interesting. 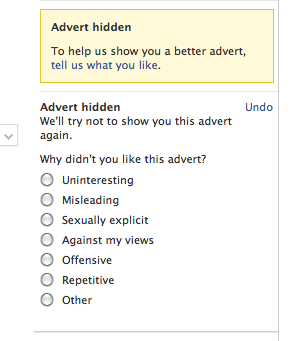 They allow you to select on the advert and say why you don't want to see it. Many users take great pleasure in tagging adverts as misleading or offensive. At least it hands control back to the user - kind of sweetens the pill. So my take on this is that this is bigger than the "Big Brother is watching you" issue. In the West are moving on from push advertising full stop. However I think this is also hugely cultural... certainly no signs of this happening in China or Africa for instance. Human brains function as if all interactions are with live people. If browsing the internet is like asking a group of people questions and having them give you answers, what would you feel if a stranger butted into the crowd and kept interrupting to ask if you wanted to buy something? Even if it was something you were interested in, it'd be very annoying. Seeing targeted ads highlights the fact that your browsing habits are being checked and logged. Many people see this as snooping (who by doesn't matter) and an intrusion on their privacy. For example, you may idly search for some information on something slightly salacious and then get presented with ads for "adult" material when you show your wife/boss something else you're interested in. At best this would be embarrassing, at worst it could cost you your job. Some people see store loyalty cards in the same light. They don't want the store knowing exactly what they bought. It's because it's not only the ads you get served, you're being profiled at the same time with sometimes unintended consequences. How target figured out a teen was pregnant before here father knew. Is a real interesting read about profiling and how far and deep it goes. Personally, my own pet hate is receiving advertising in the wrong language. The right language (in my opinion), is the language preference setting defined by my browser. Every time my browser makes a HTTP request it sends value "en-GB" in the Accept-Language HTTP header. Why major online entities such as Facebook and Google still give me adverts based on my geolocation is beyond me. I can only assume that it is an oversight. Potentially because of the insular nature of American society (just a theory). People travel abroad to countries where their preferred language does not equate to the language of the country they visit. The user's geolocation does not equate to their preferred language. See Spain (Castellano, Catalan, Basque, Galician). Me. I am British living in mainland Europe. I do not want to see advertising in German, Spanish, Italian or anywhere else I might care to live or visit. If anything it makes me actively aggressive towards the brands where I see this occur. In addition to what has been said, the 'creepy' effect is this constant reminder that you're being watched, judged and evaluated. If a human would do this, it won't be just for selecting the right ads - he/she would build an image of us, create opinions about us, treat us differently on other occassions, etc. This is how humans work, thus it's also what we - as the ones being watched -have learned to feel uncomfortable about. Thus our habits online, feeled like done in the privacy of our home, are now part of building a public self image. People feel uncomfortable with this (privacy of my home feels broken) by itself, but also that the computer might get it wrong: I've never parachuted in my life, but wanted to search a nice picture about it, and now I'm classified as parachuting-target... this gets even more relevant for things which are regarded illegal or immoral. On a sidenote, it's not only inside some anonymous Google ad server. If everyone knows ads are targeted I hesitate to use the Internet with family, certain friends, or at work, for fear of what those ads might tell about me. Unrelated to the creepiness factor, but related to targeted ads: they're still not good enough. When I want to shop, they're next to no help. If I don't want to shop, they're annoying like any ads. If I just purchased an expensive product which I took my time to evaluate, suddenly all targeted ads are completely irrelevant to me - and may even annoy me more, as I'd like to be happy with what I just bought. Even worse if I purchase from a company and the product or customer service totally sucked - now each time this product/company is shown to me, it refreshes the bad emotions about them. Personally, what puts me off (and so I rise my mental filter and never read ads) is that, in most of the cases and by definition, advertisement lies and are biased. If I'm searching for "Where to find the cheapest TV in Milan" and I'm presented by Google with results and ads, I'm gonna skip the ads right away because all the stores based in Milan, have to say that they sell the cheapest TVs, and of course only one of them eventually does. Eventually means that probably none of them really has the best prices but somewhere I can find better deals by stores that don't advertise. On the other hand I tend to trust (supposedly) unbiased advices by consumers like me (for example from someone's blog or in a consumer forum) where someone saying "I spent the whole weekend looking for the cheapest TV in town and I found it here" is worth my trust. He has nothing to gain about it, so it comes to be as a better suggestion than any adv can give. Somehow no one has mentioned yet -- ads are inherently unhelpful. If I'm searching for a baseball glove, there's a good chance I'll get ads like "OMG BUY BASEBALL GLOVES SUPER CHEAP AWESOME DEFINITELY NOT POISONOUS THIS TIME", with a website that looks like it was made by a 12 year old, and then halfway down the page (in the normal search results) will be a link to a reputable seller, which is what I actually wanted. Basically, even if the ad is for something I want to buy, there's a very low probability that the company which bought that ad is someone I actually want to buy from. Showing me things I'd actually be interested in. Meeting minimal quality/performance or other qualitative requirements. Not fail spectacularly to meet my requirements. Not fail REPEATEDLY to meet my requirements (e.g. : showing me the same crap that I'm not interested in, again and again, gets really old). Rare exception to 4th point: the occasional out-of-spec suggestion can be interesting, but it should be couched as just that: "I know this isn't quite what you're looking for, but how about ..."
Curiously, much of this is the role that a really good flesh-and-blood salesperson can do. Assess me, ask some basic questions, and then, with a deep knowledge of available product, how it performs, and an interest in meeting my needs, make suggestions. With a very high willingness to take "no" for an answer. I've been thinking for a while that a vastly superior search experience, particularly in the shopping case, would be to provide a very easy means for the shopper to exclude possibilities from the result set, and for the site to then modify its results and offerings based on this activity. Moreover, this would tend to work well and/or better in a zero-information state -- start with minimum initial prejudices (the very opposite track of "big data"), and aggressively and dynamically tailor results based on current actions by the user. Answering the original question: strong agreement with most of dhmholley's points. Though ultimately, my objection is that the experience is spooky and intrusive without particularly much addressing my needs or interests. I don't like the practice because it doesn't work and is annoying. Imagine that ADs are somehow "fixed", that they are 100% accurate, almost mind reading my intentions. I still won't process them (read, click, go to market etc.). For the same reason I won't listen to any salesman who will initiate dialog with me and try to sell me something. Because this is a sign that they are desperate, and somehow can't sell items normally. Basically that there is a catch - low quality, additional costs. And in the real world, where 99.999% of all ADs are lies, misinformation and scam it is better to stop even attempting to analyze them to save time. Every day I ignore 100-1000 physical ADs, about 5% new each day, and about the same amount of internet ADs which I cut out with Adbobk. Imagine state of the mind after I'll try to analyze every AD? No way I'm doing that if signal/noize ratio is so extremely low. 1) Nature of choice is not necessary being open to everything. In fact in many cases user spend his time REJECTING bad options. But thanks to user tracking bad options follow user without any tool to REJECT those. Search is filtering - how people from search business could possibly forget this? 2) Lots of ads, specially cheap ones are very ugly. 3) Those ugly irrelevant ads - THEY STAY there for months, if not years. And user will feel punished for months. "OMG, one search for tantric buddism, and now I have to see viagra ads everywhere! Now I see how karma works"
Not the answer you're looking for? Browse other questions tagged psychology advertisement marketing or ask your own question. Is there a “best place” to put ads in an app to avoid user irritation or will users look over them anyway? 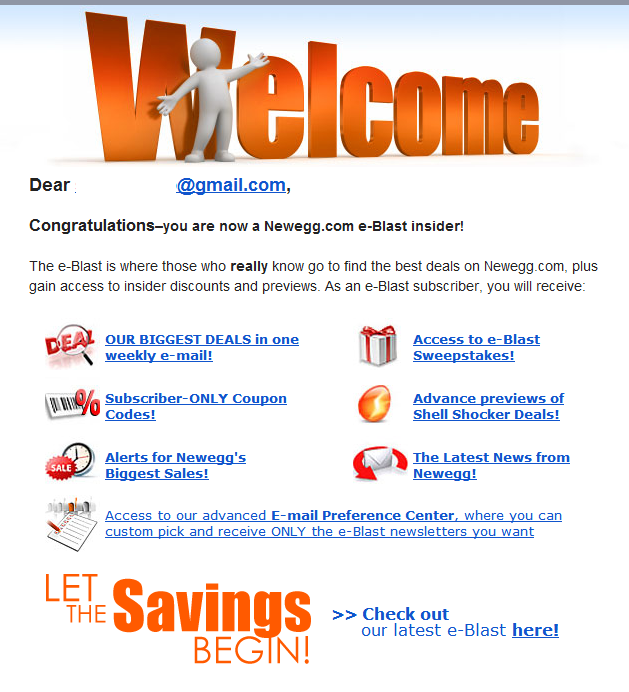 How can I make advertisements more appealing in my webpages?